Not about the Marktplatz in front of the City Hall served as the Grötzinger farmers market and central fairground, but here the location on the northern outskirts Place. First, he was named after the great winepress on the west side. It was not until the late 18th century it was called the "marketplace", since the incorporation in 1974, he is named after a former inn, see table 31 Here was indeed operated cattle trade, but mainly collected at this place the pastors of the day and the summer pastures cattle to it over the old cattle track, today's breaking forest road, drive out. The importance of the place is still visible on its dimensions and the formerly established here buildings. Besides the aforementioned wine stood the old tithe house on the north side. Here are the charges that were initially payable to the monastery administration White Castle and later to the Margrave of Baden, stored. 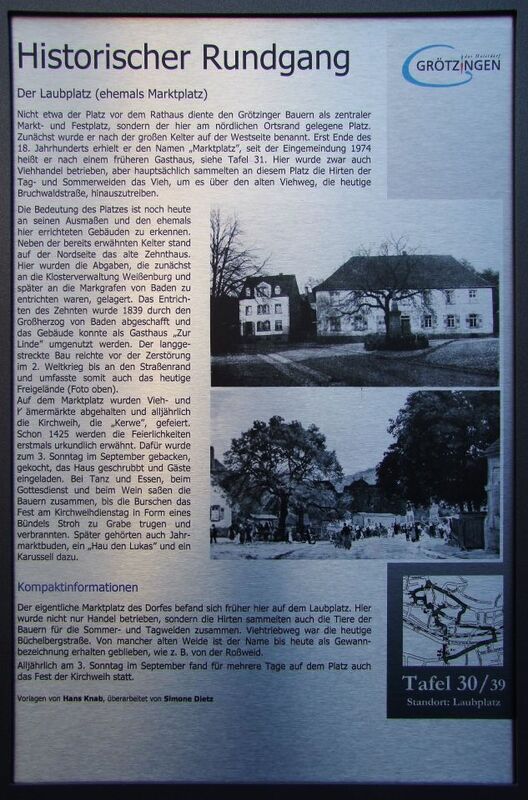 Except payment of tithes was abolished in 1839 by the Grand Duke of Baden and the building could be redeveloped as a restaurant "Zur Linde". The long building ranged from destruction in the second world war up to the curb and thus also included today's outdoor area (photo above). In the marketplace Livestock and Krämer markets were held and the annual fair, the "Kerwe" celebrated. Already in 1425 the celebrations are first mentioned. For this was the 3rd Sunday in September baked, boiled, scrubbed the house and invited guests. In dance and food, the service and the wine farmers sat together until the boys carried the party on fair Tuesday in the form of a bundle of straw into the grave and burned. Later, fair booths, one belonged to "ring the bell" and a carousel to.